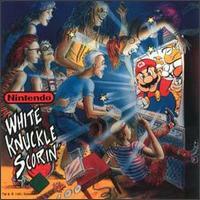 White Knuckle Scorin' is another compilation released by Nintendo, with actual bands contributing their own songs, I think. Not sure though; I don't have much info about this CD. The only Mario-related track is an excellent song by Jellyfish, with clever lyrics taking us inside the scheming, evil mind of Bowser Koopa. Also, inside the CD is a short Mario comic that is a sort of prologue to Jellyfish's song, which is just icing on the cake if you purchase this CD just for that song. 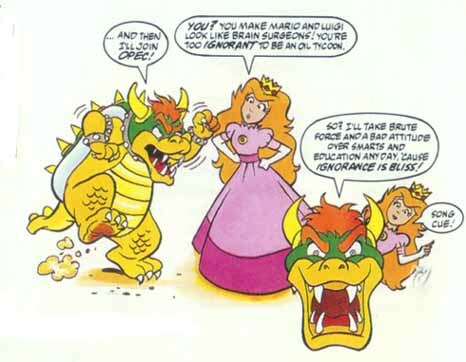 Miss Toadstool, it is I, your one and only king: Bowser Koopa. But on the whole I'd say, super-duper. If you knew just why you're here, your fear would just be heightened. So let's just say: Ignorance is bliss. Until Dinosaur Land is nothing but fossil fuel. So every hex leaves me perplexed and all I want are those plumbing fools. A picture tells it better. I'll say it again: Ignorance is bliss. Haven't you heard? A picture is worth a thousand words. You call yourself a Princess, but you're a braniac in a dress. I can't believe you waste time with these books! A big one, I mean BIG, on her brain - what a shnook! All your words are alphabet soup, a picture tells it better. On second thought I think I've made my point. Lyrics transcribed by JJ McCullough and Deezer.